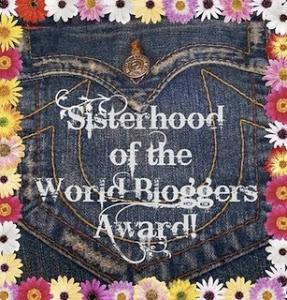 the Sisterhood of the World Bloggers Award!! since I subscribed to her blog. She is a certified personal trainer and a certified holistic nutritionist. just to name a few things you will find there. Be sure to visit Serena and check our her blog. A BIG thank you to Serena. I am so touched, moved, and humbled by your sweet nomination! You are a special lady and a blessing to me. So, the rules are that I need to answer Serena's questions here. Homespun Devotions was literally birthed in anguish. to a number of relatives, friends, and acquaintances. suggested that I needed to follow my God-given calling to write. I had no idea what God had in mind for it, or where He would take it. and I needed an outlet of ministry as my family and I waited upon the Lord for instructions concerning our future. or that it would bring so many wonderful, precious friends into my life. 2. Link to your favorite post on your blog and explain why it is your favorite. Oh, my, it is hard to choose just one!! Every post has been heart-wrenched and delved into issues that are so precious to me. of leading Kevin and me from barrenness to joyful parenthood. then be re-directed to Lisa Newton's Infertility Blog, where you can read our interview in its entirety. To be able to have a channel to express the burdens, thoughts, and prayer requests God places upon my heart within a community of such wonderful Christian friends. 4. What is your number one blogging DON’T? I don't ever want to misuse the platform God has given me. This is His blog, not mine. It is all for His glory, not for my self-promotion. I don't ever want to forget that or lose sight of that focus. 6. When you were a child what did you want to be when you grew up? a godly wife, a godly mother, and a writer. 7. What is your favorite non-blogging thing to do? 8. If you had to start your blog from scratch what one thing would you do differently? I would have let go of the need to care about numbers a lot sooner than I did. 9. What is your favorite food (calories don’t count!)? and my homemade spinach dip with chips! Glad we aren't counting calories!!!! 10. What is the one thing you just have to do this summer? Prepare for homeschooling in the fall. buying curriculum, and getting everything set up for another exciting year! Now, I am to nominate eight other SISTER bloggers for this wonderful award. Boy, was this hard to narrow down! and I didn't want to leave anyone out! Wish I could just nominate all of you....you know who you are! But, here are my eight narrowed-down choices. I hope you will all take a minute to visit these sweet sisters, when you can. Be sure to leave them an encouraging comment, too, if you have time. Now, for the last thing I need to do. I am to come up with my own set of questions for the eight bloggers above. these are the questions I would most like to ask each one of you. 1. Tell us a little bit about your blog...its purpose and your vision for it. 2. What are the events that led you to become a Christian? 3. How long have you been serving the Lord? 4. Who are the most important people in your life? 5. What is the hardest thing you have ever been through or had to face? 6. How did your walk with Jesus help you cope during that difficult time? 8. Which one passion would you describe as your driving force? 9. If Jesus Christ were to visit you in human form, what would your reaction be? 10. What is your biggest dream...what do you long for the most? Okay, so there you have it! but I hope you all have as much fun doing this as I did. Again, a big thank you to Serena at Simple Holistic Girl for her sweet nomination. God bless you all, sweet friends. Thank you so much for the nomination! Love you! You are so welcome, sweet friend. :) Love you, too! Hi Cheryl! Congratulations to you on being nominate, and to the blogs you nominated in turn. The blogging community is truly an open and loving one. You have been both to me, and to so many others too. My favorite color is purple...that's close to lavender, right? Thank you so much, Ceil. Your words meant so much to me, as always. YES, any shade of purple, I love!!!!! God bless you, sweet friend...so thankful for your visit and support! I came by to congratulate you! That is awesome. I enjoyed getting to know you better in reading your post. God bless you! Thank you so much. I so appreciate your words and support! Thank you so much, Susan! And thank you for the sweet invitation to your link-up!! God bless you!! Thank you for your kind words! And might I say your answers blow everyone else's (including me) out of the water (of course, no offense to anyone..lol). I love the questions you came up with for your nominees! Both your answers and questions are very inspiring! It is interesting to hear how each of us began our blog. Mine was also from frustration of not being received at my church, and my daughter and a friend suggested that I begin a blog and write my stories. I believe it was January 2011. I am so thankful that you did NOT nominate me for this award although it is a lovely thought. Years ago, I was involved in a multi-level group where you were required to recruit others. After loosing a LOT of money, and friends, I made a vow to never again become involved in a project where you asked others to recruit and they in turn to recruit. I am not judging, and hope you are NOT offended, just explaining the facts in my case and how God dealt with me. Thanks for sharing with us here at Tell me a Story. I am so sorry you endured that situation with your church, Hazel. And, I remember your feelings about the award. I believe I nominated you once before for the Liebster Award, and you had explained that to me, if I remember correctly. No offense taken, sweet friend. I understand. :) God bless you for being such a blessing to all of us!! Enjoyed getting to know you through your answers. I love what you said about this being God's blog .... great thought as you let Him lead you in what you post. Thanks for sharing on Tuesday Talk. Thank you so much, Michelle! I am so grateful for you and your sweet visit. :) God bless you. Congratulations Cheryl! I got a sneak peek into you today and I love what I saw. God is truly at the centre of your life. It is the best thing that can happen to anyone. Thank you ever so much, sweet friend. You are a blessing to me! So nice to learn more about you, Cheryl! One of my favorite things about homeschooling was always the planning too. I loved checking out different curriculum and figuring out how many pages we would need to do per day, scheduling in vacation days, etc. Many blessings were involved. Thank you so much, Lisa! I so appreciate your kind words. Yes, I love all of that part of homeschooling....well, I just love the whole process!! So very thankful to finally be a mother and able to homeschool, too. God is SO good! Congratulations! It is well deserved. I appreciate the perspective and wisdom and generally learning a little more about you. You're priorities are well lined, sister. Thanks for the encouragement. Thank you so much, Floyd! Do you want to hear something funny??? I know you will appreciate this...I had you on my list of nominees!!! Then, lo and behold, it hit me that I couldn't nominate you for a sisterhood award! OH, my word, I am so silly. But, if this had been open to all, you would have been on there, without a doubt. Just wanted to share that with you. I can't thank you enough for your support and encouragement and kind comments. God bless you, brother.